Actually, the connection can be broken. The fellow who first did this was Ukichiro Nakaya back in the 1930s. 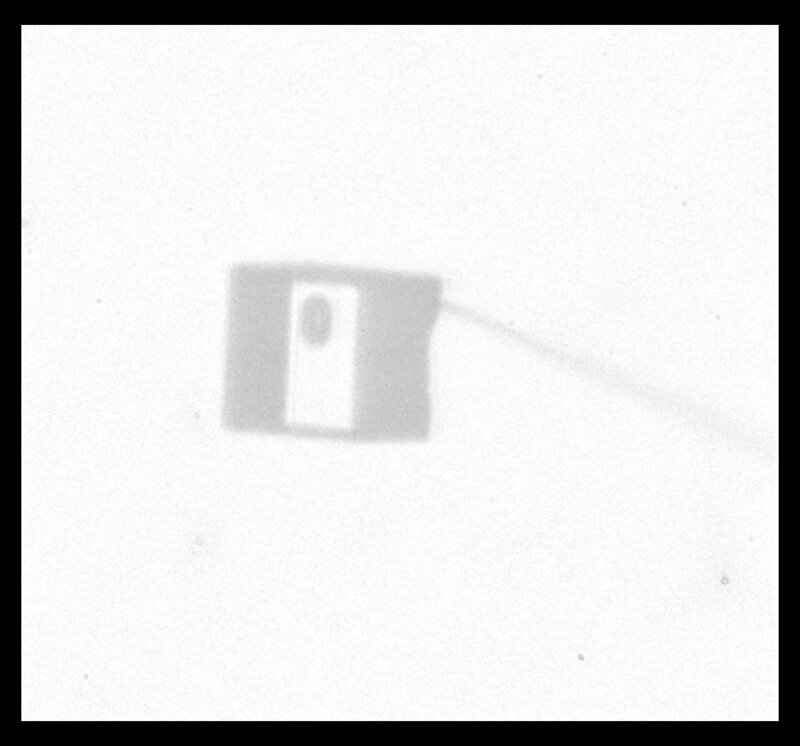 Instead of using photoshop (as I did above), Nakaya (or rather Nakaya's assistant) used a razor blade in a very cold room. His assistant must have been both highly skilled as well as very patient, because each level is separated by less than half the width of a typical human scalp hair. (Thanks to Prof. Shimada for sending me this image. I have slightly simplified it.) The image shows the central part of the branch as a ridge, with numerous valleys running down both sides. The thickness of the region in red is only 5 micro-meters (5 millionth of a meter or about 0.2 thousandths of an inch). None of this is the flat facet that we imagine a snow crystal to be. There is one flat facet however -- it is on the bottom side. Why? Do these not also start on droplets? Or are the droplets just too small? The slower-growing faces win the game and are allowed to reveal themselves. With snow, we learn that sometimes slow wins. In the above sequence, follow the red arrows for the time sequence. (From "(a)", I am borrowing some sketches I made for a publication in 2008. These differ slightly from those originally proposed by Frank.) The crystal sizes here are very small, about 1/10 to 1/2 the width of typical scalp hair (i.e., about 7 to 40 micro-meters). The axes on "(a)" show the crystallographic axes for ice, remnants of my paper. You can see though that by stage (iii), the form of the original droplet has vanished. But let's continue, along the path to a recognizable branched crystal, roughly as described by Frank. The crystal face grows outward by the spreading of layers. In the sketch above, the edge of these layers, called "steps", are shown by fine lines in the front view at right. The steps start near a corner, say at "A" or "C" in the sketch, and spread inward, closing in on the center. But soon a problem emerges: the steps are coming too fast and the center region cannot keep up. So a small pit emerges in the center of the face as you see at (b). On a symmetric hexagonal form like that above, this pit forms roughly at the same time on all six "prism" faces. (Pits may also form on the top and bottom faces, but for a crystal shape like that above, will not become very deep.) Here "SCR" stands for step-clumping region. Typically, the rim of this pit expands as the crystal grows (c). And grows. Eventually, the rim breaks through a crystal edge. 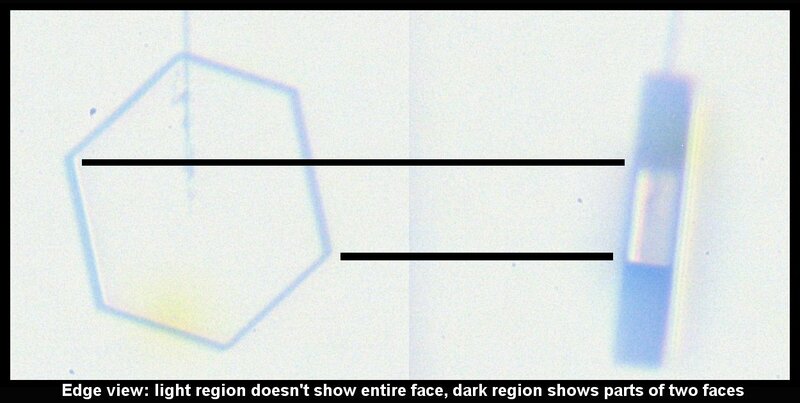 Usually, it is the edge between two prism faces as shown below. Notice that at stage (d), the crystal now has two levels, a top side and a bottom side. From this stage on, the two levels will compete with each other, with one eventually getting much larger than the other. This same process was shown in the previous post. But let's continue on and see how this develops. Either one, or both levels may sprout branches. In the case (e) above, both have sprouted (note the notches that divide the just-sprouted branches). So far, both levels are developing at the same rate. But that cannot continue: the situation is unstable because if one level gets just a little bit ahead, it will stay ahead and increase its size difference with time. In fact, the smaller level will hardly grow at all - it is stuck in a region largely devoid of vapor excess. Typically, it is the bottom level that gets ahead, as shown in (f) above because the crystal is falling down through the onrushing vapor-laden air. (The interior lines labeled in (f) above will be discussed another day.) Looking directly down on this crystal, it would look roughly like the following. Consider that every crystal is a little bit different, but the basic features in (f) exist in the original picture at the top. I reproduce it below with a close-up of the center. Some of these finer details will be discussed in a later post. Finally, as to why this process sometimes occurs but sometimes the process of the previous post occurs instead remains a mystery. There are a few factors that will favor this process though: smaller initial droplets, and conditions of slower growth. If you zoom in on the center of some snow crystals, you may see a small circle, or near circle. In some cases, the crystal will have other circles of similar size as well, but the one to focus on is the one at the exact center of the crystal. Here marks the spot where the crystal was born. The question is, what is that circle in the center? The answer is: It is the original droplet upon which the crystal first formed. Now that is the answer that I had heard a long time back. The originator, I think, was the incredible Wilson Bentley, the farmer-scientist of Jericho, Vermont during the early 1900s. The problem was that it was never clear how the crystal could build upon the frozen droplet without erasing its boundary. We see this all the time in the lab - the droplet freezes, and then the vapor molecules add onto the crystal, turning it into a hexagonal prism, and then growing into whatever shape the conditions and crystal structure determine. There are absolutely no markings, borders, or interfaces that show what the original frozen droplet looked like. It is like pouring water into a cup that is half full: after you pour a little, you cannot tell that the cup once had less water. So, I never understood how Bentley's answer actually worked. Indeed, I think that until Akira Yamashita came along and pointed out how the boundaries of the original droplet could remain, nobody knew. His argument, which he proposed just a few years ago, involved the same curious process that we found in the corner pockets (see the previous post). The frozen droplet under "a)" spreads an ice layer mainly along the top and bottom, making the cap and boot in 'b)". The molecules spreading across the flat surfaces migrate over the edges to the adjacent rim region, and plug into growth sites there. So the cap and boot spread out beyond the rest of the frozen droplet, as in "c)". 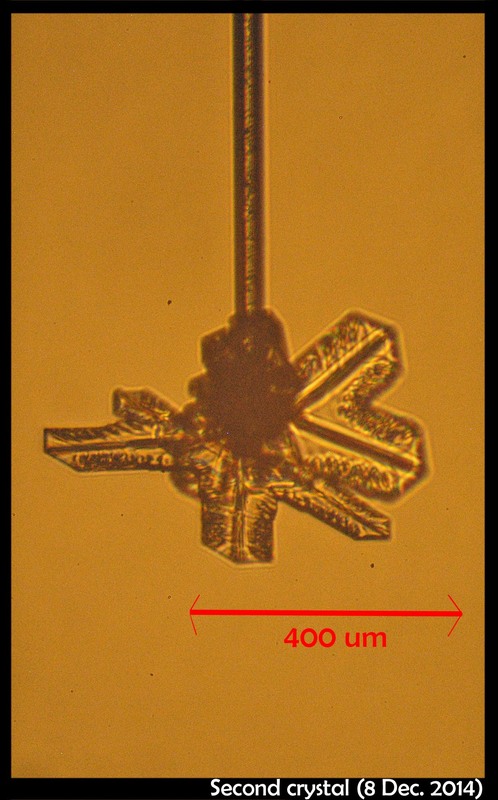 The sides of the frozen droplet are essentially in a "vapor shadow" and receive almost no vapor: they hardly grow at all, and remain essentially frozen at their original size. This process of the top and bottom (cap and boot) levels growing outward continues, making the crystal look like the empire fighter ships in Star Wars. So, "c)" shows the two levels of every snow crystal. But the top and bottom levels are too close to each other. If one gets ahead of the other, it leaves the smaller one in a vapor shadow, just like the sides of the original frozen droplet. These other Japanese physicists found out how one side gets favored: It is all in the fall orientation. Remember that snow crystals are falling through the air, even as the air pushes them higher. Small, flat objects tend to hang in the air broad-wise, like a frisbee or flying saucer. The lower side (boot) gets a little more vapor, being upwind, and robs the top side (cap) of its fair share. So the lower level gets much bigger. Later, this frisbee flips back over, but it is too late for the stunted level: it remains forever stunted as the other level takes off, growing the six main branches, side-branches, and whatever features develop on its long journey to the ground. But these stunted regions remain, including the sides of the original droplet. Not all snow crystals have this center. 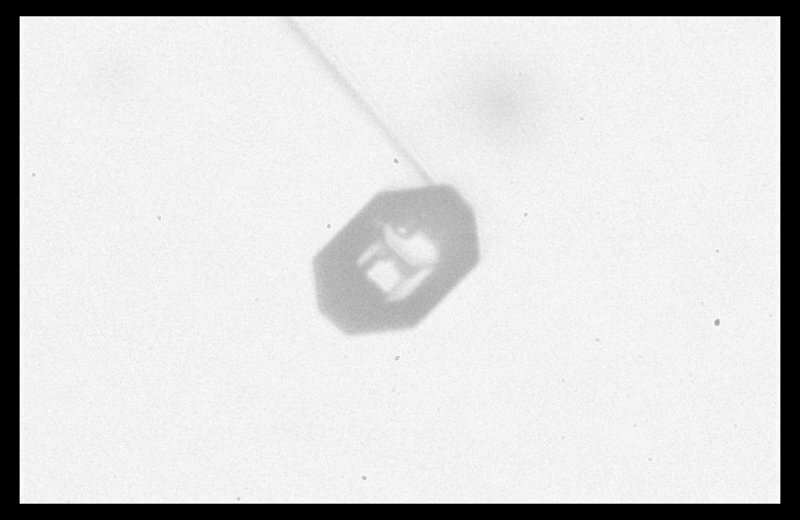 In many, the droplet gets erased as we observe in the lab. More on that in my next post. If you read this far, you now know something about snow that essentially nobody else does. Finally, about those other circles on the crystal, the ones that look similar to the one in the center. These too are frozen droplets, droplets that had a startling run-in with the crystal and froze on contact. When they do this, we call them "rime". As I mentioned in my previous post, the formation of corner pockets on ice crystals is inexplicable by the standard theory of snow-crystal growth. Akira Yamashita had recently proposed a mechanism for corner pockets, though he had applied it to a different situation. In his case, he observed the early growth stage of a relatively large frozen droplet as it transitions into a faceted crystal. So, his situation dealt with a round crystal becoming sharp-edged. In our case, we started with a large sharp-edged crystal, then made it become round by sublimating (analogous to evaporation, but for a crystal), and finally made the crystal re-sharpen by growing it. The process is sketched below. You may want to open the image in another window and enlarge it. At the top, you see the simple hexagonal prism crystal in its initial stage. At stage B, the crystal sublimates (we reduced the amount of vapor), meaning that it is starting to shrink. The shrinking starts from the corners, making them become rounded. Then, in stage C, we start growing the crystal again, and the interesting things start to happen. As the water molecules from the vapor stick to the surface, they remain mobile on the surface. On the surface, they wander around until latching into a little nook. (In crystal-growth theory, these 'nooks' are actually tiny kinks in a surface step.) The region just over the edge has plenty of nooks, as it is rounded. So, the edge grows fast and starts to protrude and overhang (stage D). Overhangs from the top and side faces merge in stage E, creating the pocket. Afterwards, water molecules in the pocket surface move about making a more round, disk shape. About being inexplicable by the standard theory of snow-crystal growth, this standard theory does not include the wandering of the mobile surface molecules over the edge. Now, if the new theory applied only to this corner-pocket formation, then it would be of little importance. But the wandering process cannot apply to only this situation (how would the molecules know when to start or stop? ): It must ALWAYS be happening. And, as I mentioned earlier, I realized that the wandering process may help explain many other curious snow-crystal features that I had previously found inexplicable. In other words, it may be a fairly important discovery. Who will hear its story? A few years back, a correspondent of mine, Professor Akira Yamashita of Japan, long retired, sends me an email. In the email, he had a document with words and pictures of some small crystals that he'd captured back in the 70s. They were small crystals, essentially freshly "hatched eggs" from the frozen droplets upon from they had started. But some had small pockets of air near their corners. To those who have studied any sort of crystal growth and have some familiarity with crystal-growth theory, these corner air pockets, or "bubbles", were in impossible locations. They should not be there. Pockets will form near face centers, not corners. But Prof. Yamashita also had a theory about their formation. His theory first looked sketchy to me, but I appreciate hearing about new ideas, so over the following years kept revisiting his theory, getting to think that it had merit, and wondering if it had other applications. After the sublimating, the subsequent growth kept a permanent record of the sublimation cycle in the form of 12 corner pockets, one pocket for each of the 12 corners of the crystal. These are pockets of air, just like the six large 'petal-shaped' pockets of air you see nearer the center of the crystal. They are forever stuck in the crystal. Stuck there until the crystal, with all of its features, vanishes back to air. After seeing this, we ran a few more experiments, and each time we slowly grew, then sublimated, then grew again, we got corner pockets. The name 'corner pockets' refers to their location when they are formed; namely at the corners, next to the crystal perimeter. However, they remain essentially fixed in position as the crystal grows, and this means that as the crystal perimeter expands outward, the corner pockets will appear further within the crystal. Analogously, the 'center pockets' shown above formed at the face centers, on the crystal perimeter, back when the crystal was much smaller. As to the theory of their formation, and how the theory can explain other observable features of snow crystals, you'll have to wait for a subsequent post. This, the left crystal of the pair described two posts below, grew much more slowly on its basal faces (front & back in the left image). The way it grew, and its big difference with the crystal on the other capillary (described two posts below), indicates crystalline perfection on the basal faces. Imperfections on the other crystal caused its basal faces to grow relatively fast. My older sister sent me this photo on a recent morning. 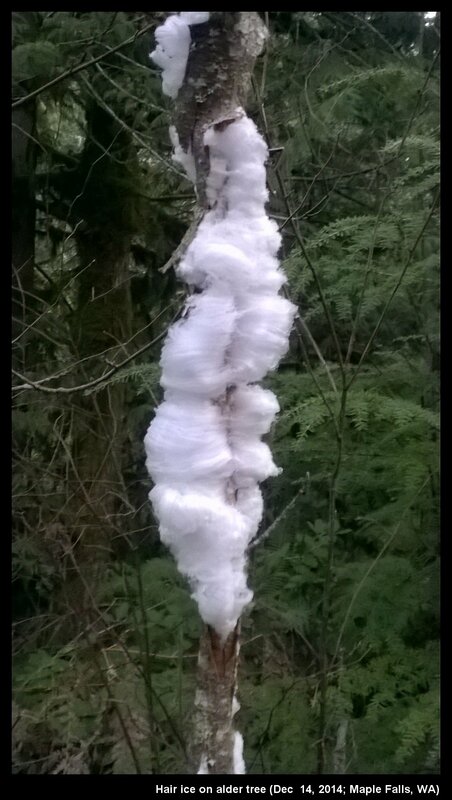 This is hair ice growing from an alder tree. All of it grew overnight, formed when liquid water near the outer trunk surface (beneath the bark) froze. This creates an ice front in each pore-like structure. Water inside the trunk flowed out to the ice front, pushing each hair-like strand of ice outward. 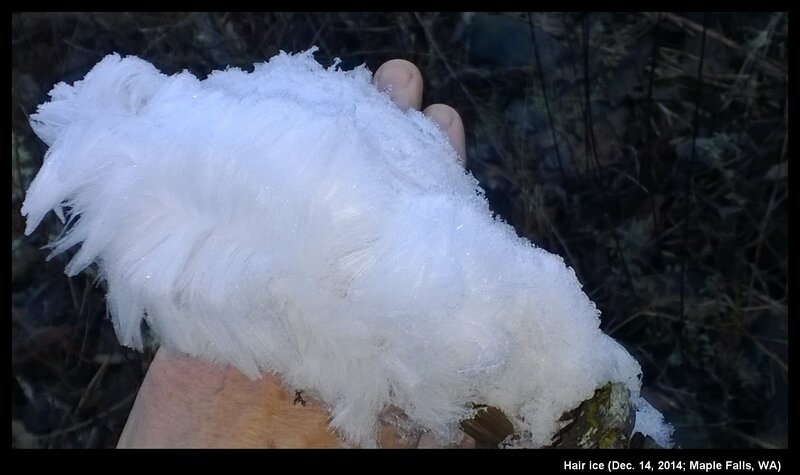 It probably does not get as cold under bark unless the bark is partly peeled off, so the hair ice comes out of bare spots in the trunk, as shown in the photo above. The air temperature got down to 26 F that night, and the tree was next to a dirt road, and thus partly exposed to the sky. 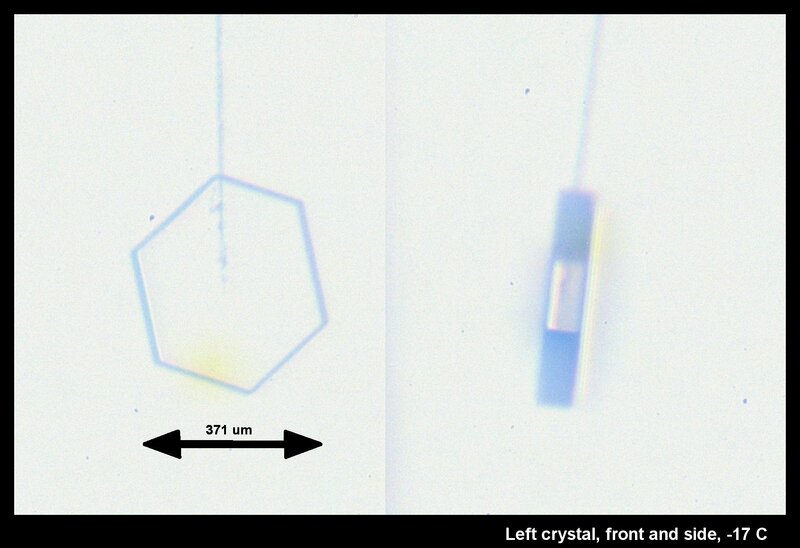 A Crystal Pair, Several Views, and a "Man on the Crystal"
One advantage of the new apparatus is the capability to grow up to three crystals at a time, each on its own capillary. It is also very useful being able to move each capillary around. Having success with a single crystal, we tried it with two, and much thinner, capillaries. This time, we had to cool the apparatus down to about -38.5 C before they appeared (previous cases were about -20 C), and to my surprise, they both appeared at about the same time. (Polycrystalline blobs, as are more common at these low temperatures.) Due to some troubles we were having with the vacuum (later discovered to be simply a case of the pump getting shut off), we warmed the crystals up to -17 C, sublimated them, and regrew them. The capillaries slide up-down on axes that intersect, designed this way so we can bring the crystals nearer or further apart. For the above image, they were relatively close. The crystal on the left is a thin plate, whereas the one on the right appears to be a short column. Both grew under the same conditions, but grew into different forms. The apparent "man in the crystal" (i.e., face, as in the "man on the moon") shown in the view above arises from dark lines, which are due to face-face edges on the other side of the crystal, a horizontal "terrace", also on the other side, plus an air pocket inside the crystal. 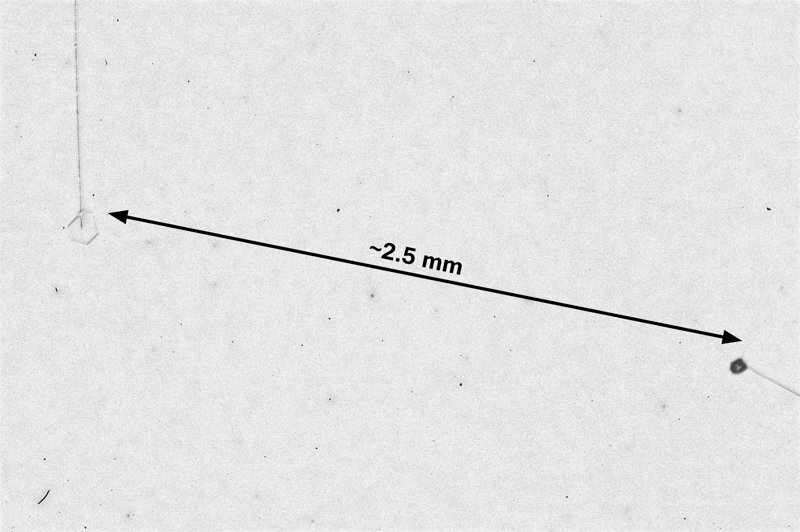 The horizonal extent of the crystal is about 150 micro-meters (microns). The view above clearly shows the interior air pocket. Also, on the right, you can see the profile of the "terrace" mentioned above. The crystal is a short hexagonal column, but two opposite prismatic faces are much larger than the other four (because they grew much slower). 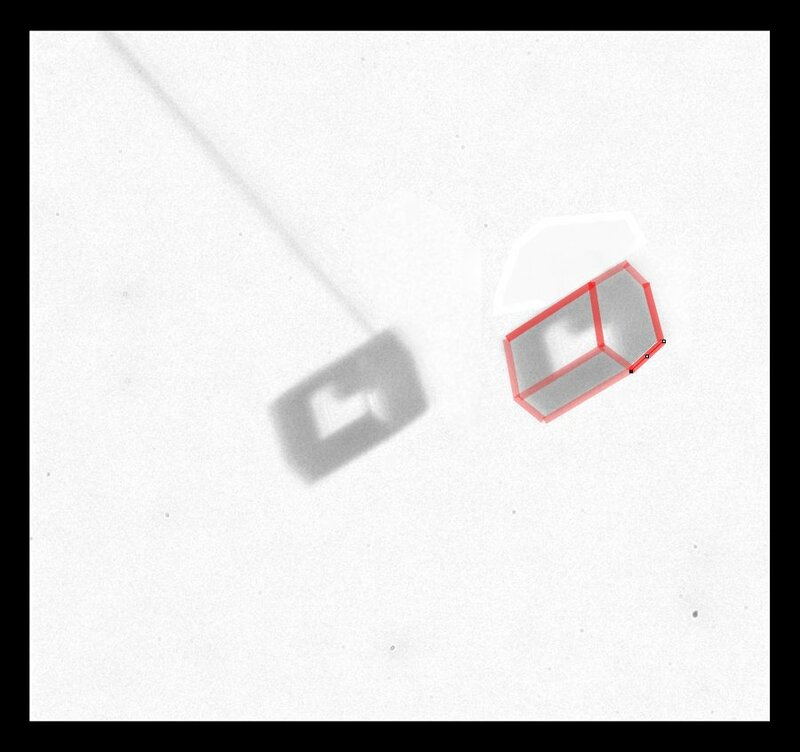 I copied the crystal image at right and outlined the crystal edges in red. 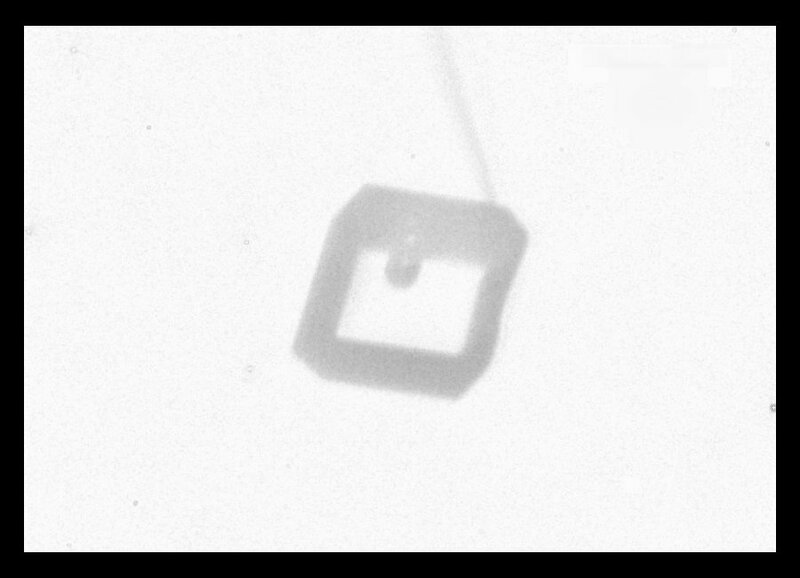 This shape of crystal is thought to give rise to one of the "Parry arcs" in the sky, which I showed in an earlier post. Another interesting thing about this crystal is its very weak attachment to the capillary. The molecular forces holding it up were so weak that torques arising from the pull of gravity would cause the crystal to slowly rotate downward. In general though, these cases show how useful it is to be able to move and rotate the crystals. 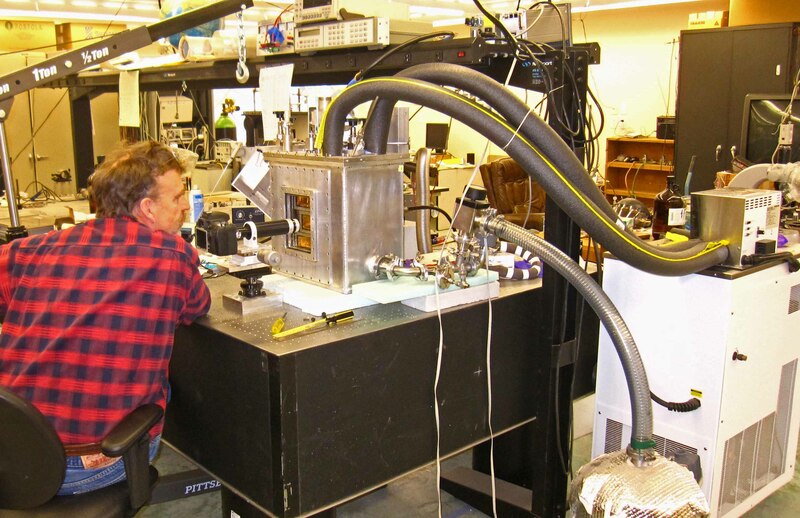 After several years of planning and several more years of construction, our new crystal-growth device is operational. 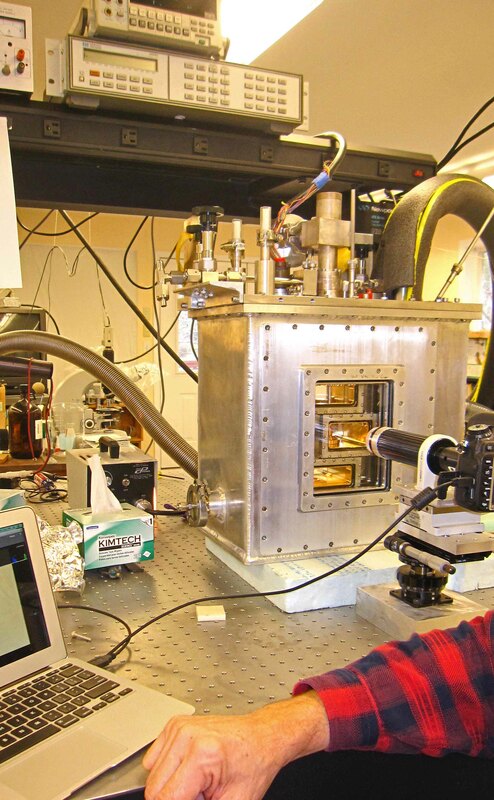 We are now tuning the electronics, vacuum system, data collection method, and other aspects, but we can indeed produce ice crystals on a glass capillary under controlled conditions. The first two capillaries we tried basically exploded, due to my having loaded them with way too much water, but the third produced a nice frozen droplet. The frozen droplet, or "droxtal" did not grow on account of all the water that had spewed down from the previous attempts, but we cleaned up the debris, and started anew. That case, pictured above, produced a nice spatial dendrite. I could control the growth condition quite well, and kept growing, sublimating, and regrowing the same crystal for a few days. We now need to refine our capillary-making method and make them about 10x thinner (as I used to do in my previous experiments). The overall setup is pictured below, Brian at the controls. The white thing on the right is the cooler. It pumps cold methanol into the big aluminum box sitting on the table. That box is actually three boxes: an innermost crystal box (consisting of several chambers), a bath box that holds the cold methanol cooling fluid, and a vacuum box around that to help insulate the system. All the controls enter from the top, so we have lots of things sticking up on top: fluid in-out ports, vacuum control of the growth chamber, reference chamber access, access to two vapor-supply chambers plus vacuum control of the chambers, a valve system to connect vapor to growth chambers, and a bunch of wires... 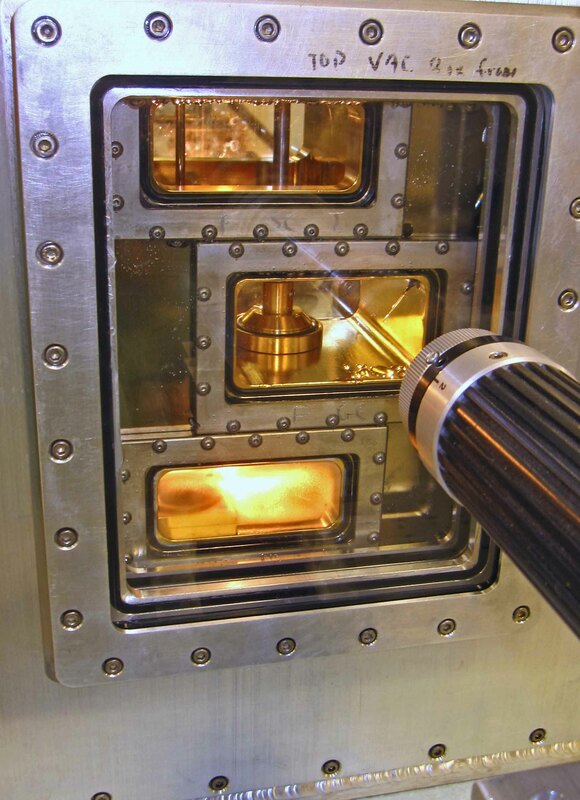 The inside of the innermost crystal box is gold-plated to deter corrosion and help us keep contaminants to a minimum. We hope to have more crystal images soon. 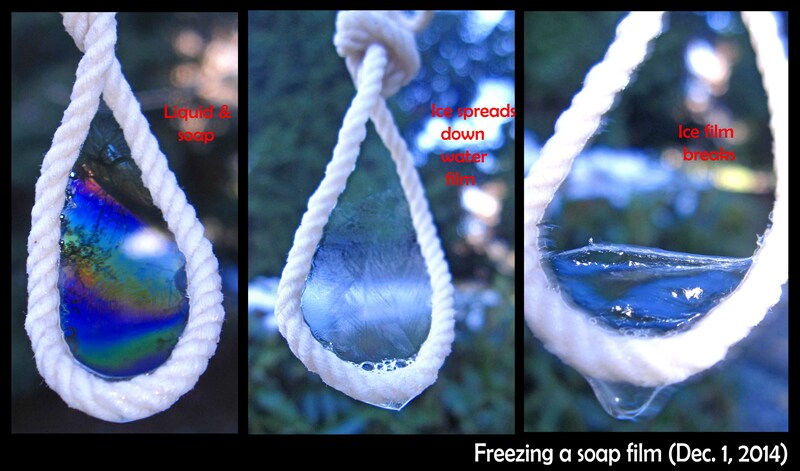 Upon seeing this morning some recently posted pictures of freezing soap bubbles, I decided to give it a try. Fortunately, we have been having freezing temperatures recently. And coincidentally, my older daughter had just purchased some glycerin for making hand lotion. (Glycerin is a very useful ingredient in soap-solution.) I mixed up a cup of solution, using crushed ice in the water to make it cold, found a bit of twine, and headed outside to a shady spot in back. Sometime later, I will work on freezing larger bubbles. I imagine though that if I had my polarizing sheets with me, even a frozen film could dazzle. Next time. If you have experience freezing large bubbles, please let me know. My ice films would break within about a minute of the first signs of ice formation--it would be nice to know a better method.